‘There’s just me and just one bus and that’s the way it’s going to stay. I’m happy at this size,’ said Mike Woodhouse, owner and Transport Manager of M&J Minibus. We usually cover considerably larger operations in B&CB, but there are plenty of our readers up and down the country that are, like Mike, running smaller fleets. So we thought it fitting to put the spotlight on such an operator, prompting Chris Peat to visit the company’s new operating base in Brandon, Suffolk. 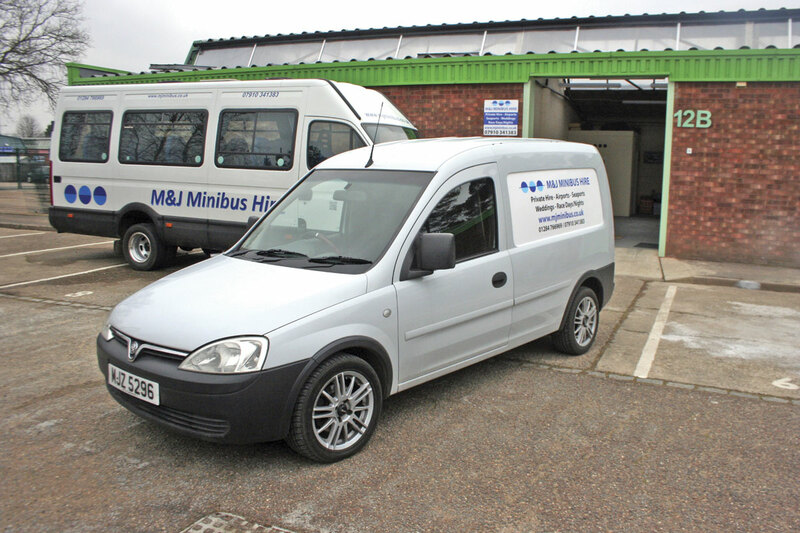 Mike started M&J Minibus in 2007, with his wife, Jackie. The company’s name combines the pairs’ initials. Mike is the operator and only driver for the firm, with Jackie helping out with admin and VAT forms. Mulleys, based near Mike and Jackie’s home town of Bury St Edmunds, were a great help for Mike in the early days. David Mulley assisted with setting him up. Giving this assistance could be seen as a case of returning a favour, as Mike had previously helped out by doing some ski trip work for Mulleys when he was on annual leave from other jobs. 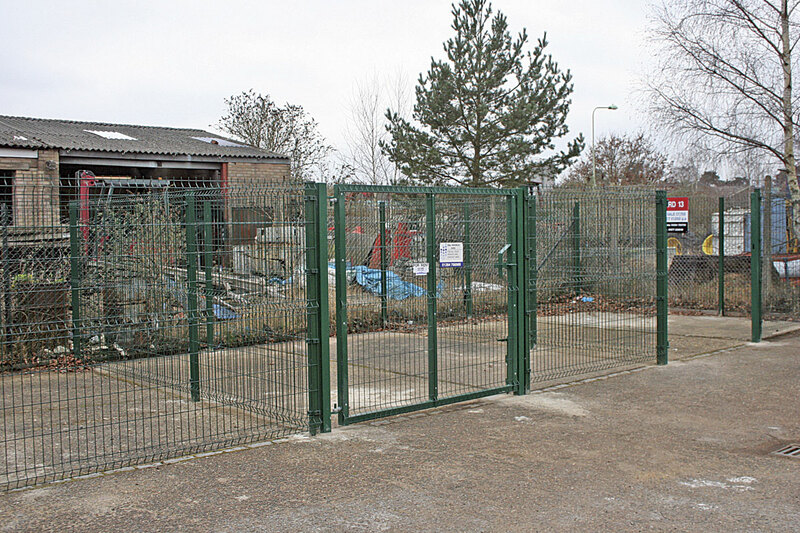 Mulleys lent a hand in the burgeoning company winning its ‘bread and butter’ school work, when they told him of an operator struggling to run a contract for school services for children of the military personnel stationed at nearby RAF Lakenheath. Mike took on this contract and it has provided a good, solid foundation for his business. ‘I just built the private hire work up from there on top of that,’ said Mike. ‘I’ve certainly started to see customers come back and use me again.’ He says there are quiet periods, but he knows to plan for them. In general though, he is kept very busy. All types of private hire work are undertaken, from sea and airport transfers, to race days and other outings. ‘Weddings are a huge one for me,’ he said. Also helping with his work is his increasingly close relationship with Suffolk County Council. He is in the third year of a three year contract for school services, which he hopes will be extended for another year soon. The local authority has also provided him with further jobs, including five days to Portsmouth. He said the Council is ‘fine’ to work with. A particular challenge of being a smaller operator is ensuring contracts are renewed, especially when they provide ‘bread and butter’ work. If those few contracts are not signed again, then ‘you’ve got to find something to replace them with, and fast.’ This can be a particularly alarming concern for smaller operators, especially as government funding has been cut in recent times. 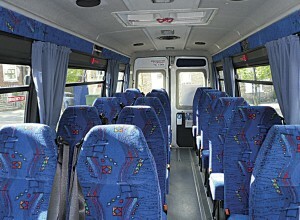 However, in Mike’s case, his private hire work helps ensure any potential lost contracts can be made up for. Having long term contracts is definitely beneficial, says Mike, ‘They allow you to plan ahead.’ Such contracts may include a number of safety stipulations, perhaps more so than they ever have, but he says they are still awarded largely based on price. He has certainly felt the affects of decreasing budgets, with the government pulling tighter on its purse strings. ‘If fuel hadn’t have come down, then budget cuts would have had an even bigger affect,’ he said. 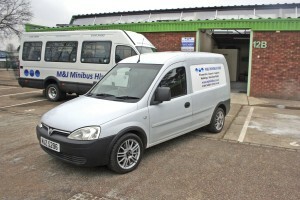 The Iveco is not the only vehicle M&J Minibus owns. 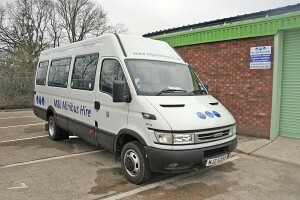 There is also a Vauxhall van, complete with a similar personalised number plate to the minicoach, which is used as a general run around, picking up supplies and for ferrying back and forth to the depot and Mike’s home. Although Mike has always run small vehicles, if a contract demanded it he would not be against the idea of trading in for a larger coach. This is entirely dependent on what work he gets in; he certainly has no plans to do this at the moment. When the time comes to change his minicoach, he will probably go for another Iveco. 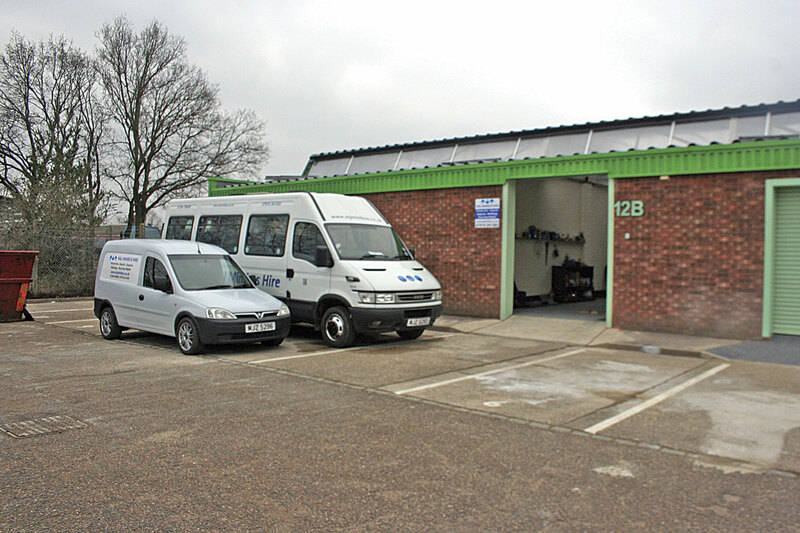 One of the advantages of the new business unit and compound is that it provides garaging for the vehicle when not in use. Mike hired some builders to modify the entrance, raising and widening it to allow him to get the minicoach inside more easily. 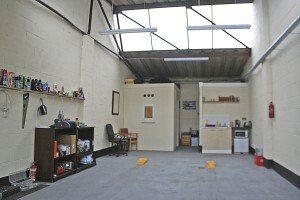 Mike and his father also put a wall in place to partition off a snug office space. The work took a few weeks to complete and Mike has been in the building, his second registered operating centre, since January. The 650 square foot site also includes a fenced off compound that can be locked. This is not used by Mike currently and he is thinking about renting it out. Mike said it was important for him to buy the building, it was ‘an investment that had to be made, I wouldn’t have rented’. Another benefit of the site is that it is ‘round the corner’ from RH Turner, the company he uses for service and repairs on his minicoach. 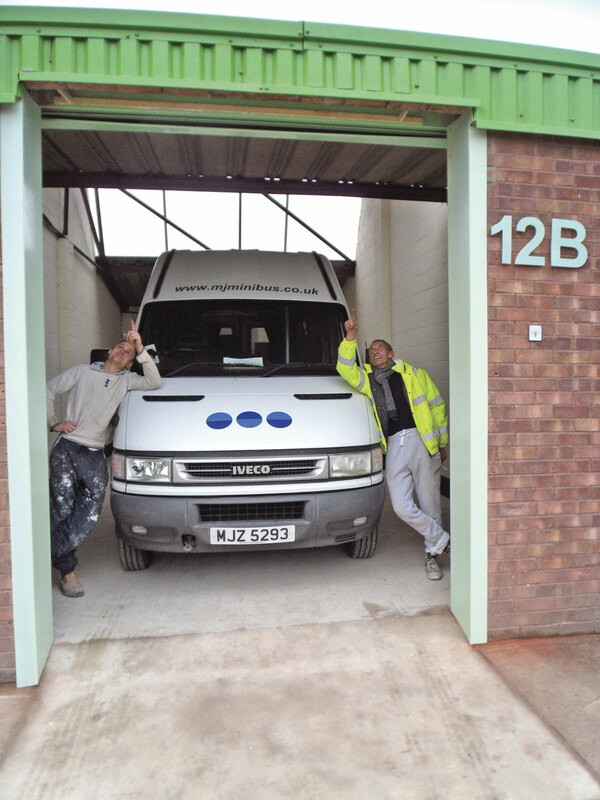 Moving into the new site was ‘meant to be’, he claimed. Extra work has come his way through simply being located on the industrial estate, with nearby businesses noticing his vehicle. For instance, he has gained a few airport transfer jobs. Despite winning such work, he says he has not ‘pushed’ the business in the local area yet. He intends to ‘hit Brandon fairly soon’, marketing his services to the village and nearby places. Using the internet to promote his business is something Mike has fully embraced. With the same ‘do it yourself’ attitude as when he converted the Iveco, he put together his own website. This was done from scratch, with no prior knowledge of website design. He simply taught himself how to do it. Social media is another way he promotes the business. He has a healthy number of Facebook followers and uses other sites too. He regards these sites as another ‘shop window’ for the business. If M&J Minibus’s name sounds familiar, then it may well be that they won one of our Photo Friday competitions, having entered a winning photograph via Twitter. 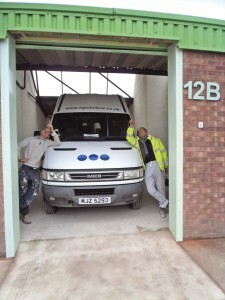 The picture showed the two builders who modified the new site gazing and pointing at the top of the building’s entrance. The picture caused quite a bit of interest in the office, puzzling at what they were looking at. Turns out they were just admiring their handiwork! Another way Mike has gained work is through going to industry events, which he is a real fan of, especially as he says it is a ‘really friendly industry to be part of’. 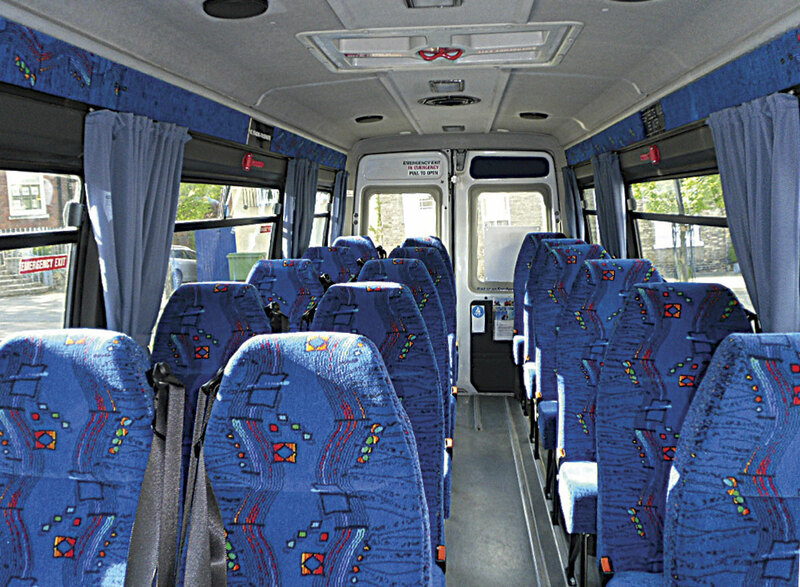 Through attending such events as the evening gala at the UK Coach Rally, he has got to know several more operators and as a result of that was passed on some extra work. In particular, he finds operators that only have larger vehicles sometimes pass on job enquiries from smaller parties that they cannot fulfil due to not having the right sized vehicles. 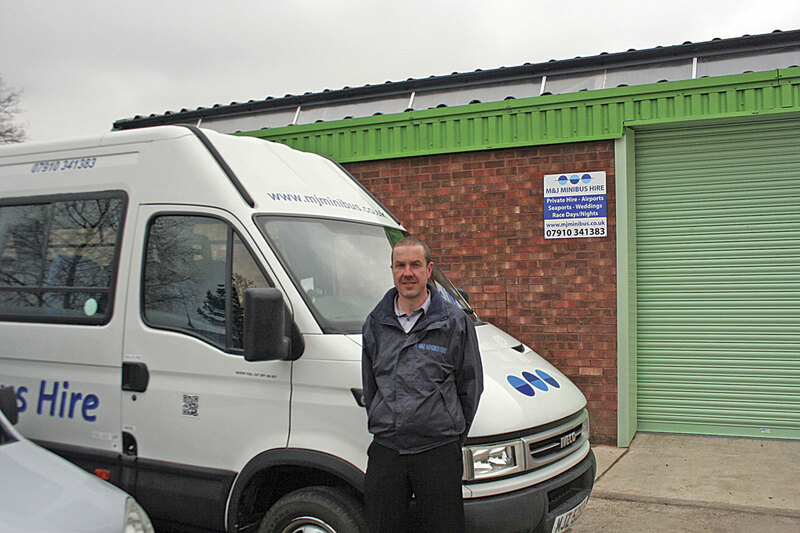 Talking to fellow operators, Mike has noticed one of the main concerns is the lack of drivers in the industry, as there is a real shortage of replacements for when current generation retire. Obviously, being a one man operation, this is not something that affects Mike. For Mike, it is ‘not about getting big. The main thing for me is getting school contracts.’ He mentioned one operator who had grown, saying ‘they now wish they hadn’t’. So what does the future hold for Mike? He has two sons, one of whom has recently passed his driving test. Will they follow their father’s footsteps and enter the industry? ‘If they did want to come onboard, then it’s here for them,’ he said.